If you own a vehicle that has airbags made by Takata, you definitely need to have them replaced. In July, the latest death known to be caused by the faulty Takata equipment occurred in Louisiana. In this issue, we’ll talk about why the Takata-made airbags are so dangerous, and talk about what you should do if you feel that you’ve been a victim. Problems with the Takata airbags appear to originate from too much force being used when they deploy. Affected drivers and passengers have had shrapnel actually sprayed into their faces with horrific results. The inflators used by Takata are known to use explosive ammonium nitrate to fill the bags in the event of a crash. The problem with ammonium nitrate is that it can break-down over time, which can lead to it burning too fast and blowing apart its metal canister. The U.S. government feels the dangers posed by the airbags are so great, that they ordered the largest auto-safety recall in the nation’s history. Disturbingly, less than half of the estimated 41 million affected vehicles have been recalled. Why didn’t Takata take steps to prevent this? Takata is in trouble for actually attempting to hide from the public test results that showed there were problems with their airbags. In fact, the U.S. Justice Department accused three former Takata executives with falsifying and altering test results. “The risk that they allowed to happen is really reprehensible,” said Barbara McQuade, the U.S. Attorney in Detroit, whose office worked on the two-year investigation. 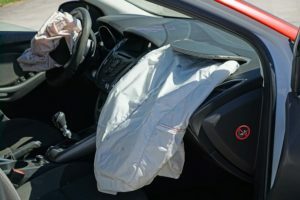 For that lack of action, Takata was ordered to pay $25 million in criminal fines; $125 million to persons injured by the air bag defect; and $850 million to automakers that bought the inflators. What should I do if my car has a Takata airbag? First off, check to see if your vehicle is on the Takata Airbag Recall list. If your 17-character Vehicle Identification Number (VIN) is on the list, get in touch with a local dealer to have it corrected for free. It doesn’t matter if the dealership is not where you purchased the vehicle or if the vehicle is no longer under warranty. If you’ve been injured in Alaska by someone else’s negligence, call Barber & Associates. As illustrated by the story above, many companies care very little about injuries to customers. That’s why you need the power of the knowledge of a lawyer who knows how to fight and win on behalf of victims. Remember, when you’ve been hurt, expenses can climb drastically. That’s why it’s crucial to leverage the knowledge of an attorney skilled in personal injury law so that you can begin to be compensated for medical bills, lost wages and other expenses. For a free consultation, call us at 907-276-5858 or get in touch with us via email.